Lovely... such a lovely word! I adore how it rolls off my tongue and yes, yes... I use this word often. So send a clean, feminine, and lovely hand-stamped card to tell someone how special they are to you! This is EXTRA Special as the lovely stamp and pretty paper are FREE, come and see!! 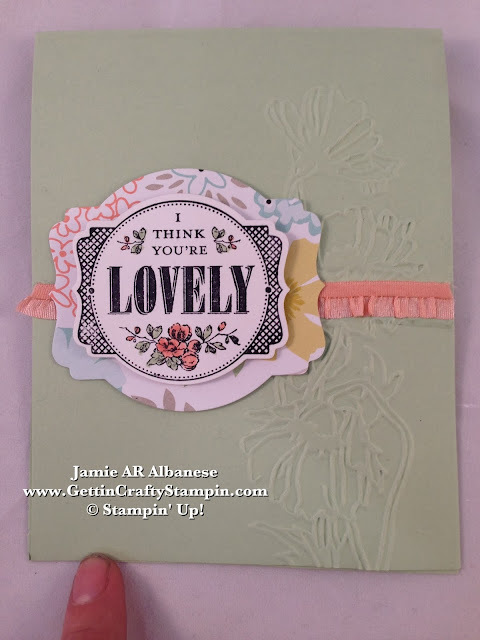 Stamping this 'I think you're lovely' sentiment from the FREE Sale~A~Bration Catalog's* Your Lovely stamp set with Black ink on Whisper White card stock. Lay this on the Magnetic Platform and Big Shot Die-Cutting Machine. Using the Deco Labels Framelits pop this perfect image out! Do the same with the next size up Deco Label Framelit and the Sweet Sorbet FREE Sale~A~Bration *Paper!! *FREE for a Limited Time!! These Stamps, Papers, Card Kits, Banner Kits, Digital downloads and more are available with any $50 Purchase! It is UNLIMITED! See MORE when you click HERE! Emboss the Pistachio Pudding card stock with the Big Shot Die-Cutting Machine and the Flower Garden embossing folder. This is a subtle but pretty way to add to a card. Lay a strip of Sticky Strip across the card. Remove the red backing and place the Crisp Cantaloupe Stretch Ruffle Trim. This feminine accent will pick up the pretty patterned Sweet Sorbet FREE Designer Series Paper! Using the Stampin' Dimensional adhesive to hold raise this card to the next level (lol). 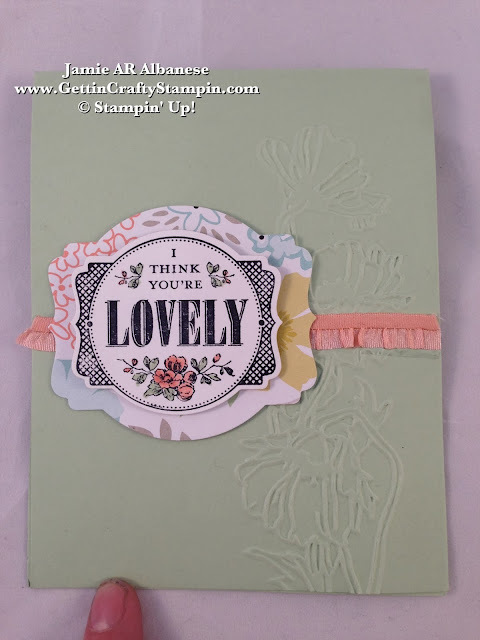 The Stampin' Dimensional adhesive will also hold the layered lovely greeting above the Crisp Cantaloupe Ruffled Trim. Accent the Your Lovely stamp with the In-Color Stampin' Write Markers in Crisp Cantaloupe and Pistachio Pudding for a cohesive and pretty look!